Your use of these graphics is subject to the term set forth in this End User License Agreement. 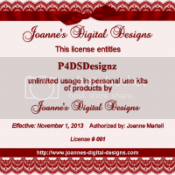 All images created by P4DSDesignz and are © By Lori Staton (all rights reserved). 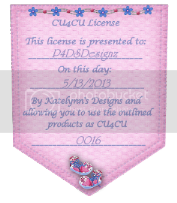 By purchasing these images you’re to obtaining a license to use these graphic images and designs and are agreeing to the terms of this user license. These images are for personal use only. They may not be reproduced for sale or redistributed in any form or way. No commercial use is permitted. Commercial use means that in use of graphics that generates incomes, regardless of any amount. Layouts may not be submitted to any other type of publication without prior consent. You may not share, rent, resell or distribute in any manner or form, any of my graphics, original or manipulated, as a set, individually, or as a part of a collection. You are the only one alone that has the right to use these graphics per this license agreement. You may not alter these graphics and call them your own. 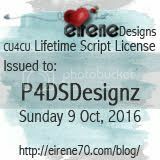 You may alter my graphics to use in only your personal use only. When creating Sig Tags. Please only use my kits and graphic. Unless you check with me first since I love to have my kits and images used to promote my kits. 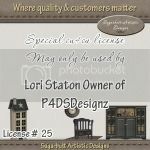 Disclaimer: Lori Staton accepts no responsibility for any loss and /or damages arising in any manner out of the use of the content of these scrapbooking sets. Though I have taken due diligence to assure that all of these files are in good working order, defect-free and virus-free, user assume their own risk.